The Magistrate Court Of Abia State, has on the 25th of October, heared the case of 51 Biafra activists who were arraigned before Chief Magistrate Lilian Ugbaja in Umuahia. At the commencement of the proceedings, Mr O. O Uche, counsel for the prosecution, told the court that he will be transferring the case to the Director of Public Prosecutions, hence the case was adjourned to the 4th of December for a continuation of the trial and if the witnesses are provided. The activists who were illicitly arrested by the Nigeria Army, following the declaration of "Operation Python Dance", are undergoing unsubstantiated and ill-founded charges, which include; Murder, Belonging to an Unlawful Society, Terrorism, Felony, Robbery and other frivolous charges. The activists were brought to court in handcuffs by the Prison officials, who led them with the cuffs into the court room, until the presiding Magistrate ordered for its removal. The dehumanizing act of the Prison officials and other Security agents against the Detainees dismayed family members of the activists, who came in solidarity of the accused, as they expressed outrage to the hearing of everyone, including the Magistrate. Journalists were also barred from staying around the court premises, during and after court proceedings. Nigeria Security agents were seen molesting IPOB Family members, as they were pushed inside the court room immediately their case was called upon for hearing. 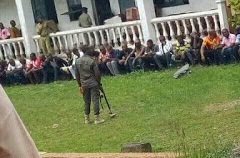 The detained activists, were kept under the scorch of sun after court proceedings, left in the open, beaten up and pushed into the prison vans that conveyed them back to Aba Prisons in Abia State.